News of a cool new toy comes from a colleague’s recent trip out to the MBL @ Woods Hole. It is the perfect gift to spark the curiosity of a budding young (or old) neuroscientist. 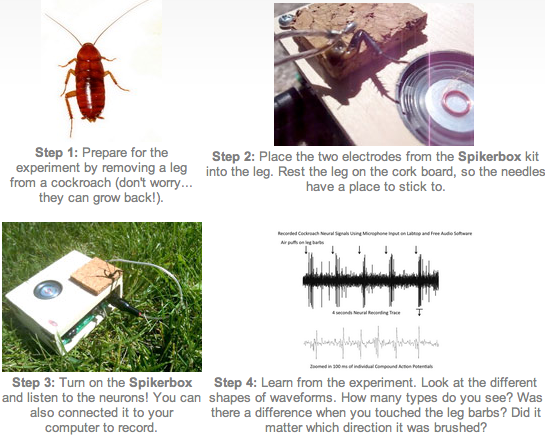 Backyard Brains makes the world’s best value electrophysiology rigs. The SpikerBox comes pre-assembled for $100 or build your own from a bunch of parts for $50. These rigs are surprisingly powerful. You can go out in the yard, catch a bug (or buy a cockroach), strap one on and start recording neuromuscular potentials. The box interfaces with gorgeous iPhone/iPad so you can hear, see and record the action potentials. They don’t make a big point of this, but you can also wire it up so that the piezo-speaker can drive an electrical stimulator of the cockroach’s leg. You can make the leg twitch to whatever signal input you give it. The educational possibilities of this gear is really limitless.